Plans are currently being developed to erect a wooden carving at each end of town commemorating the Community of the Year and Trustpower awards wins and celebrating our magnificent community spirit. Their exact location is yet to be finalised. 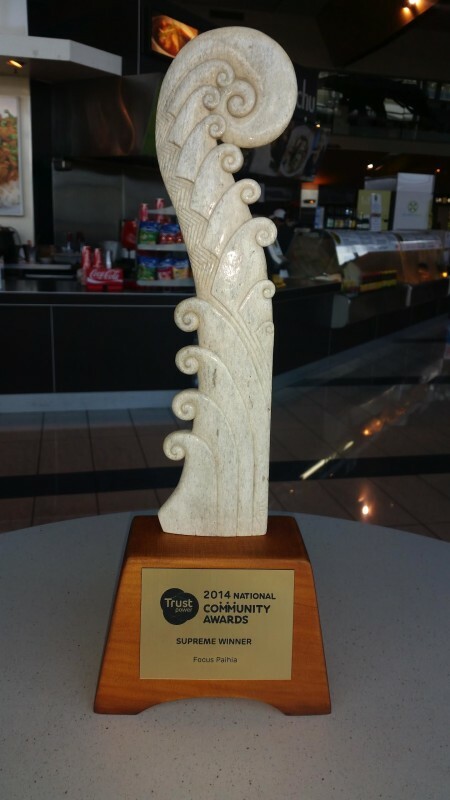 The trophy that Focus Paihia received for winning the Trustpower Awards will be the design. Tania has sought and been granted the permission of the carver of the trophy. It was handcrafted by Owen Mapp and was carved from the bone of a sperm whale. The concept of the piece is about community looking after those who need assistance. The sheltered and smaller koru to the right are the citizens who need assistance. The koru to the left are the grass roots of community who support from within, the people on the street level. The delicate weaving pattern running down the left depicts the weaving together of individuals to form strong community bonds.